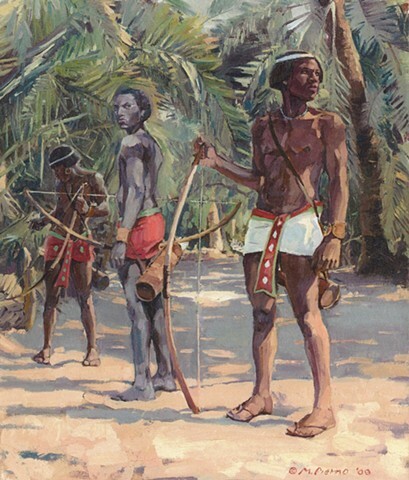 This painting is based on the wooden model of a troop of forty Nubian archers found in the tomb of Prince Mesehti from the Eleventh Dynasty, c.2000 BCE. Amongst Nubia’s most prized exports were its exceptionally skilled archers. Nubia itself was known as “Land of the Bow”. These three warriors have been hired by the Egyptian army and await orders on a field of battle.